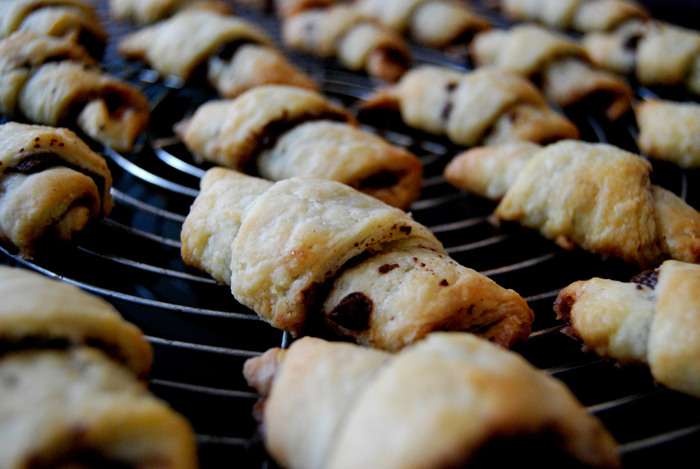 Chocolate Cinnamon Rugelach, Happy Hanukkah! 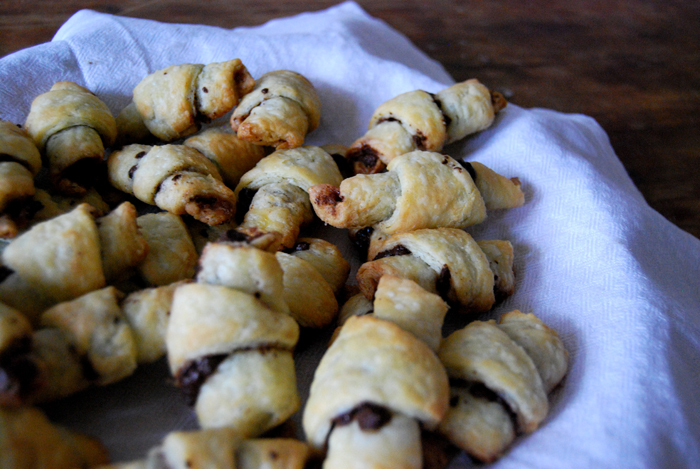 We are invited to celebrate Hanukkah together with our friends and godchild and I will contribute rugelach which is a wonderful flaky, croissant like pastry. They are made traditionally for the important Jewish feast Hanukkah, the “Feast of Light and Dedication”. When I tried them the first time I fell in love with their flakiness, they are buttery but still light. They taste divine, absolutely addictive, and due to their tiny size you end up eating lots of them. 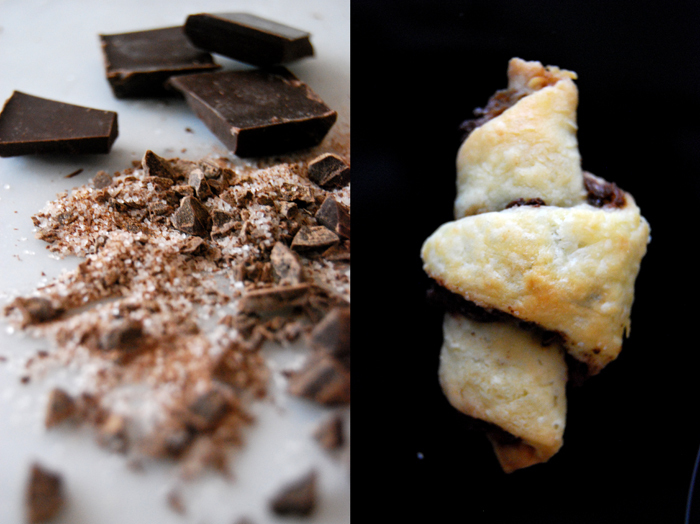 I enhanced the chocolate filling with cinnamon (which I love all year round), so it fits perfectly to the season. The pastry is a bit like short crust with added cream cheese which makes them so fluffy but still buttery. Look at the photo and you will want to try one! You will need a baking tray with baking parchment. Keep in mind that the dough has to sit in the freezer for 30 minutes or in the fridge for at least 1 1/2 hours. Mix the dry ingredients (flour, icing sugar, salt). Cut the butter with a knife into the flour mixture until there are just little pieces of butter left. Mix with the dough hooks for a few seconds. Add the cream cheese and work it into the mixture with a fork or the mixer to get a crumbly texture. Form 2 discs and put them in the freezer for 30 minutes. The dough should be very cold but not too hard, still rollable. Preheat the oven to 185°C / 365°F. Put baking parchment on your baking sheet. Chop the chocolate finely and mix with cinnamon and sugar. Roll out one disc. I do this between floured cling film as it become too sticky otherwise. When the diameter is roughly 30cm / 12″ you should have reached the right thickness of a couple millimeters. Cut the disc like a cake into 12 triangles. Take one slice after the other in your hand (the dough might still stick a bit to the foil but don’t worry, it is elastic) and sprinkle with your chocolate mixture. Don’t forget to set aside half the chocolate mixture for the second pastry disc. 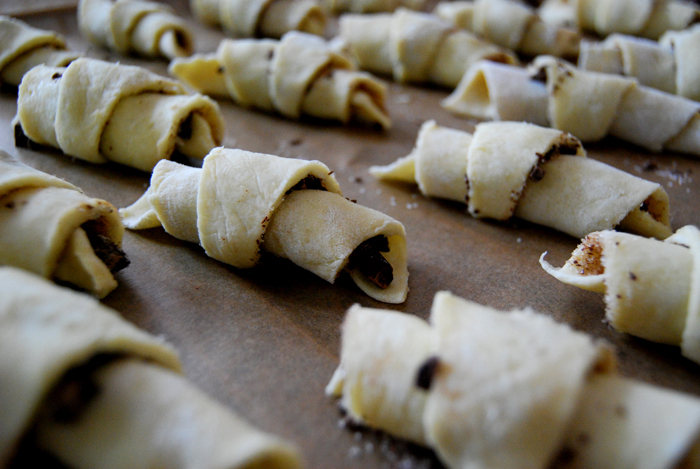 Now roll the little rugelach in the palm of your hand tightly into a croissant shape and put them on your baking sheet. Follow with the second disc or leave it in the freezer if you want to stop after the first batch of 12. I recommend doing them all at once as you will regret it if you don’t. When you have rolled up all 24 (they should all fit on one tray) bake them in the oven for 13 minutes or until puffy and golden brown. It’s best to check them after 10 minutes to be sure that they don’t get too dark. Let them cool on a wire rack for a few minutes and enjoy with your tea or coffee. They are also great for a late breakfast or brunch or even for a party as they are perfect fingerfood.